and this was literal -the picture is from my kitchen back in the Bronx in 2004. The grafts were cumbersome to deploy and required long 24-28F sheaths that frequently required iliac and aortic exposures. The revolutionary breakthrough was the fact that thoracotomy and partial cardiac bypass could be avoided. Durability was largely assumed as these patients rarely came back for followup. Fastforward to 2015. 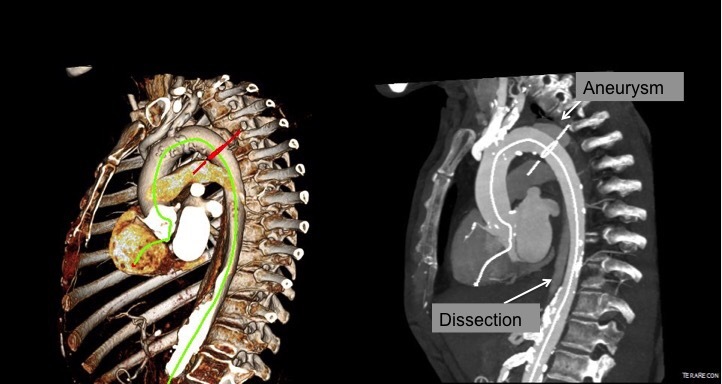 CTA is done with 64 slice CT scanner with EKG and respiratory gating eliminating the artifacts that caused Dr. Mattox to assert that aortography was the gold standard. Software based image reconstruction can aid treatment planning in ways that greatly exceed the caliper and ruler methods we had in 2004. The grafts are currently into their second generation of development and have small profile and trackability that allows for percutaneous delivery and treatment. The aortogram shows the tear along the inner curve. These lesions typically require coverage either partial or total of the left subclavian artery origin. This patient had a dominant right vertebral artery and I felt he would tolerate even full coverage of the left subclavian. The device, a Gore C-TAG device which has an FDA trauma indication, is clearly better than our homemade device. Deployment does not require pharmacologic or electrical bradycardia or asystole. The idea behind this design is conformability of the smaller stent elements. The aortic injury is even outlined by the stents in the aortogram above. The bird-beaking that was common to the prior generation of graft is not seen in this aortogram. Where does this need to go next? At 18-24F access requirements need to become 12-18F and for the same reason, the grafts need to be available down to 14-18mm as trauma doesn’t just happen in middle aged men. Aside from that, it is a definite improvement over what we had in 1995 and in 2004. The figure above shows the summarizes the problem that brought the patient to his local hospital and triggered his transfer to our acute aortic syndrome unit. The concept is that all chest pain of cardiovascular origin gets intake through a vast intensive care unit staffed by cardiovascular intensivists. Stabilization, workup, transfer to operating room or interventional suite all happens in an ICU that encompasses almost a city block. The patient is an older middle aged man with sudden onset of back and abdominal pain. He was on coumadin for a prior SMV thrombosis and treatment for a ruptured appendicitis -antibiotics with plan for staged appendectomy. 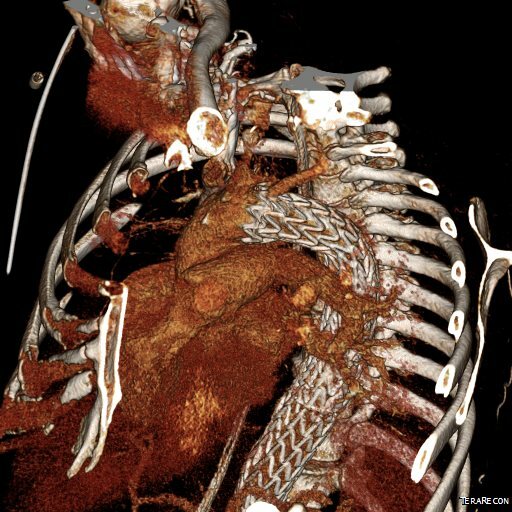 CT at his local hospital revealed a type B aortic dissection (TBAD) that extended into his superior mesenteric artery. Bovine arch and TBAD in 3DVR view on TeraRecon Aquarius reconstruction. 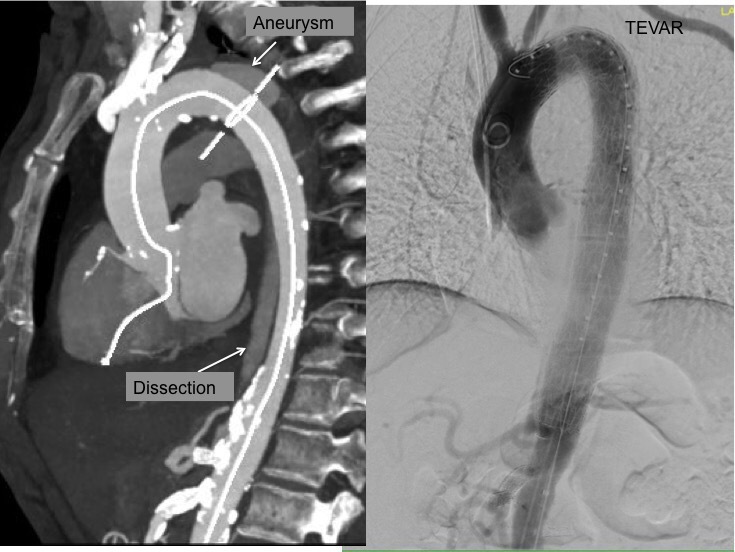 The aortic dissection terminated in the infrarenal aorta. The celiac and SMA had true and false lumen perfusion, the right kidney was perfused through the false lumen, the left through the true. Both legs received true lumen flow. The dissection started at the left subclavian artery origin. 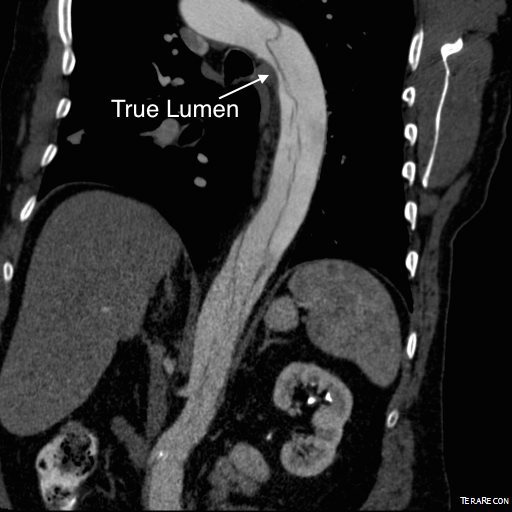 The false lumen compressed the true lumen up at the proximal descending thoracic aorta. This is an important finding because in this configuration with much of the filling of the dissection from the distal reentry sites, the false lumen acts like a pressurized, compressive lesion. With time, the adventitia around the false lumen may become aneurysmal if the false lumen fails to thrombose or obliterate. When the dissection is acute, the flap may cause a direct obstruction to flow or a dynamic one that depends on the pressure difference between true and false lumen. 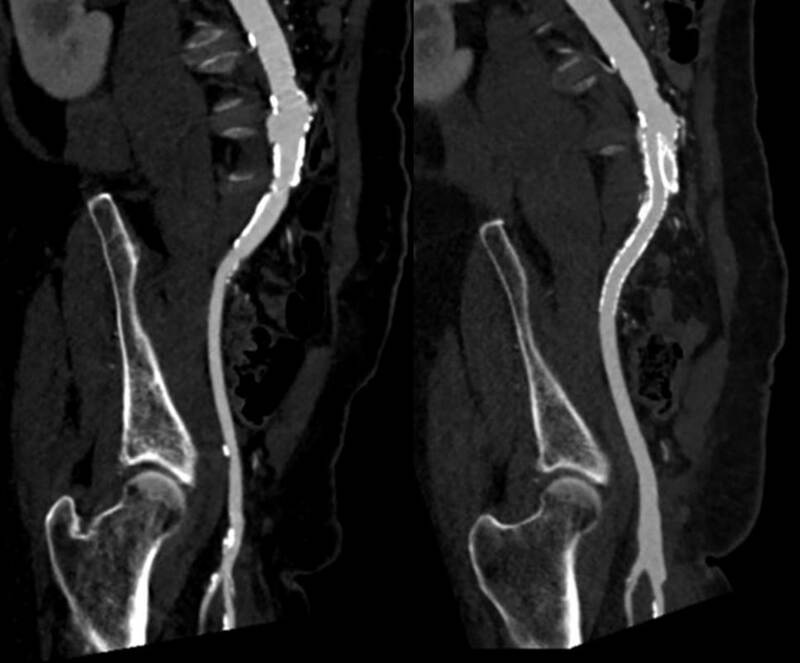 In this patient, thrombosis occured in the SMA beyond the origin due to dissection and decreased flow. This was consistent with the patient’s complaint of generalized abdominal pain and examination findings of pain out of proportion to the exam, indicating acute mesenteric ischemia. His laboratory findings were within normal ranges, indicating this was early in the process. It is important to remember that no lab value correlates with acute mesenteric ischemia except very late in the process, and acute mesenteric ischemia remains a clinical diagnosis (reference 1) that is associated with a high mortality rate. He was taken to the hybrid operating room. Right groin access was achieved and wire access to the arch was achieved. 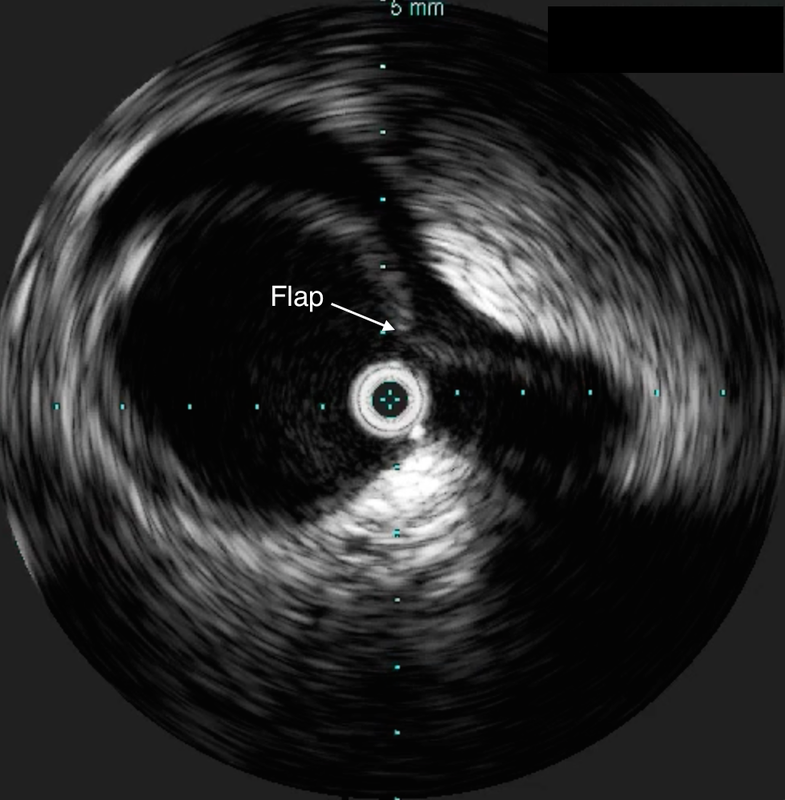 IVUS (Intravascular ultrasound, Volcano) was used to confirm the location of the wire -I believe this is an important adjunct as simply passing the wire doesn’t guarantee travel up the true lumen. 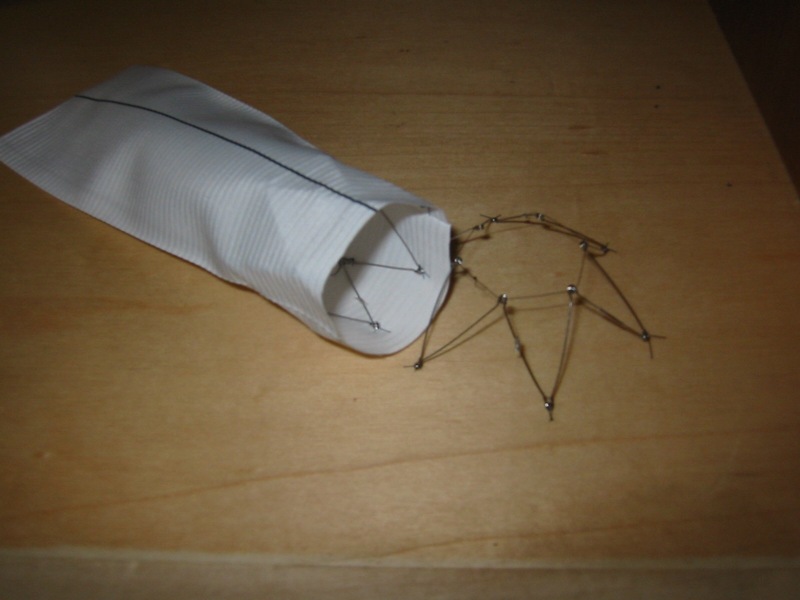 A conformable TAG endograft (CTAG, Gore) was delivered through a 24F sheath into position. 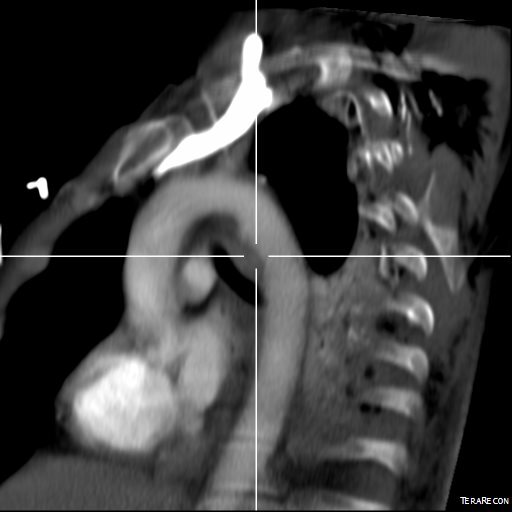 Two devices were used to cover the thoracic aorta from the left subclavian artery to a position immediately above the celiac axis. 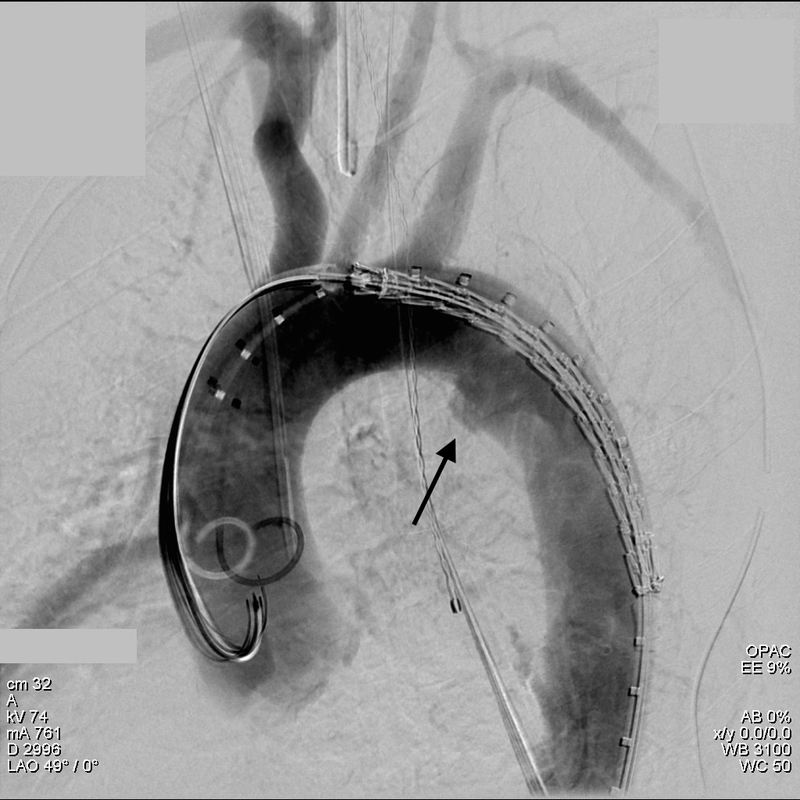 The left subclavian was partially covered -the bare stents covering the rest. This excluded the proximal entry tear of the TBAD. 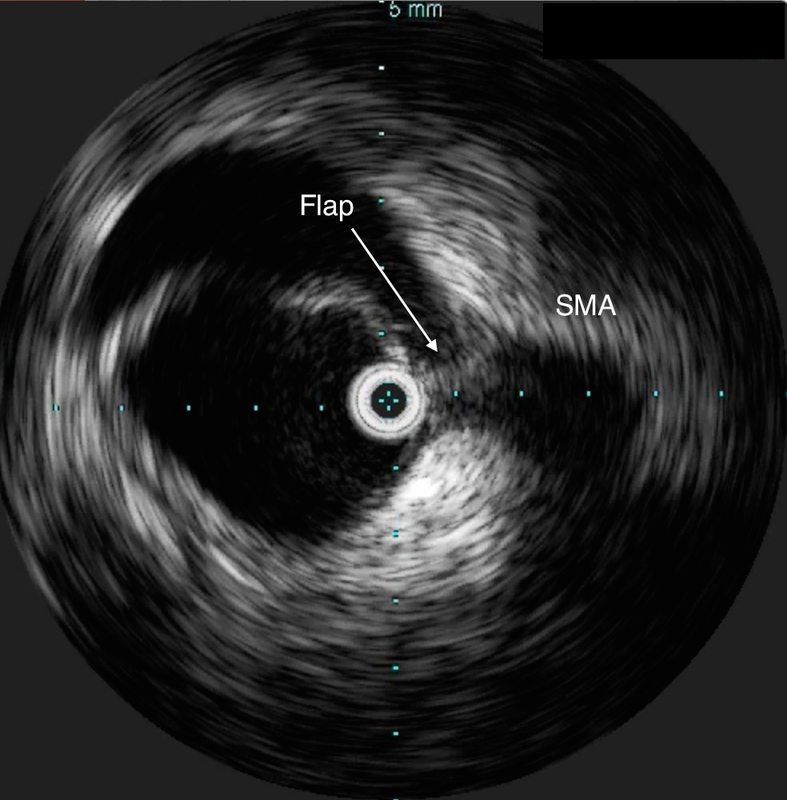 IVUS (image below) showed improved lumenal diameter of the true lumen into the SMA. Once this was done, wire access into the SMA was achieved. 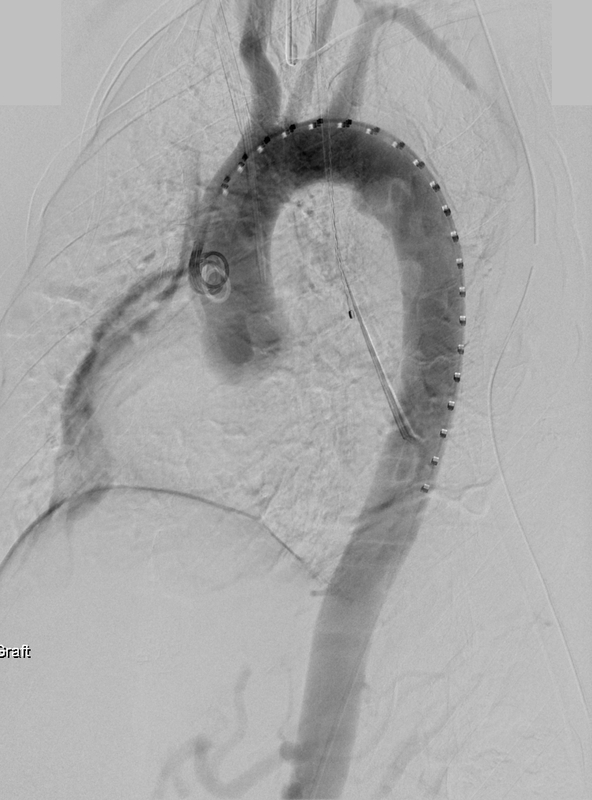 This was technically challenging from the groin, and the backup plan was access from the left brachial artery which had been prepped. With patience, 6French access into the SMA was achieved. 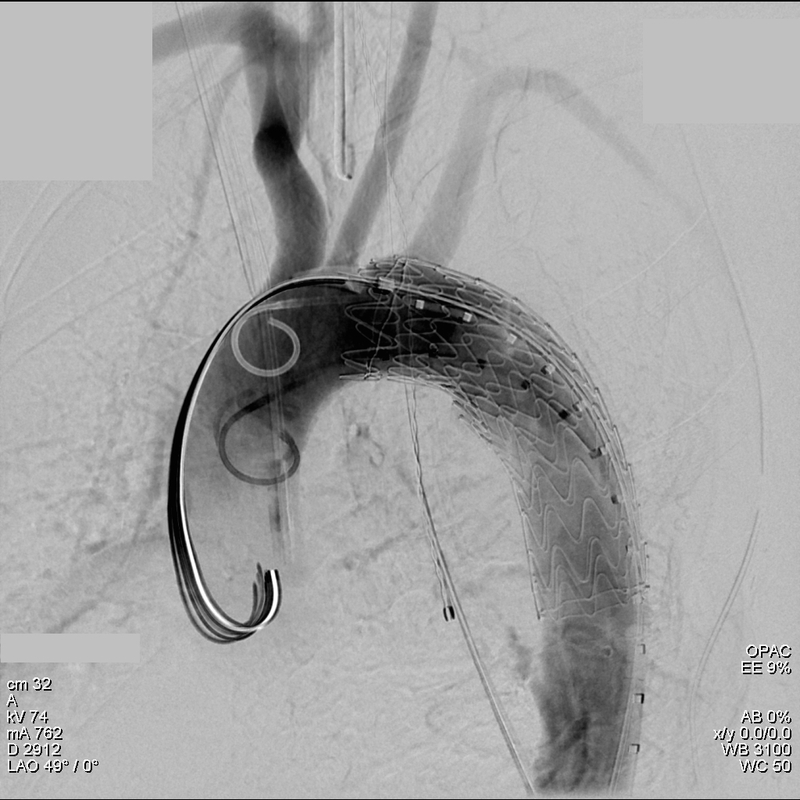 The origin was stented with a balloon expandable 8mm x3cm stent -sizing was based on IVUS and CT. This creates an alarming arteriogram as the stent appears oversized on subsequent runs -it is important to remember that the false lumen still takes up space beyond. Arteriography located the thrombosed segment and the reconstituted SMA beyond. 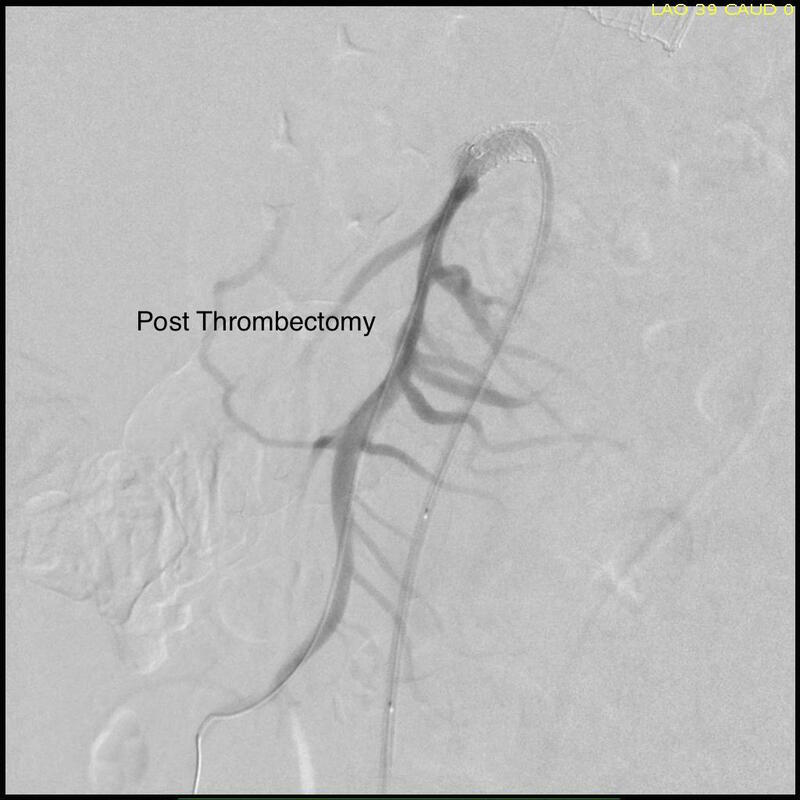 Wire access was achieved across the thrombus. 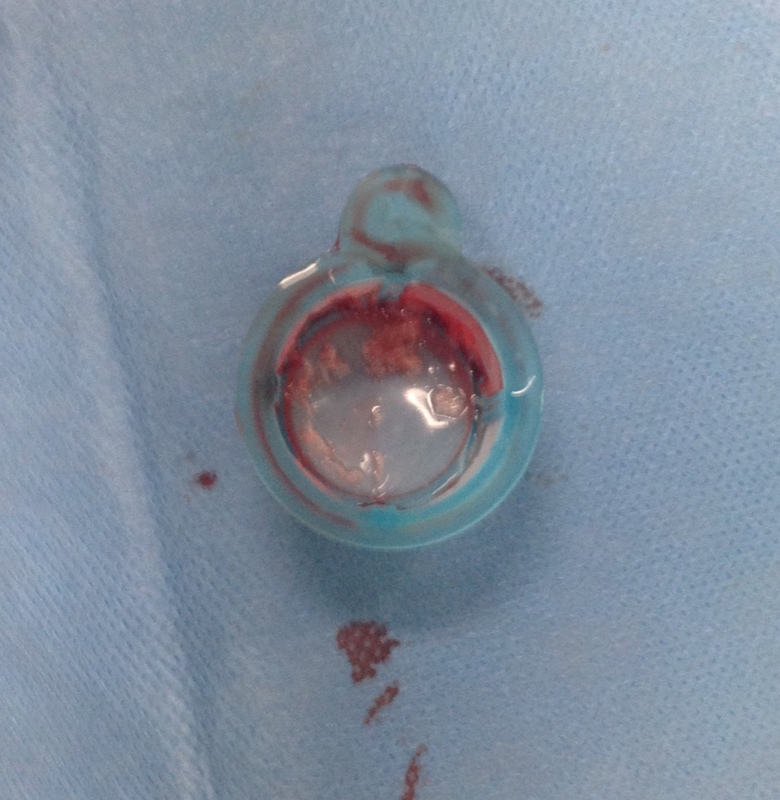 At this point, I had a range of options for thrombectomy including simply aspirating which retracting a catheter. This was not optimal as I could lose subsequent wire access or reenter the false lumen. 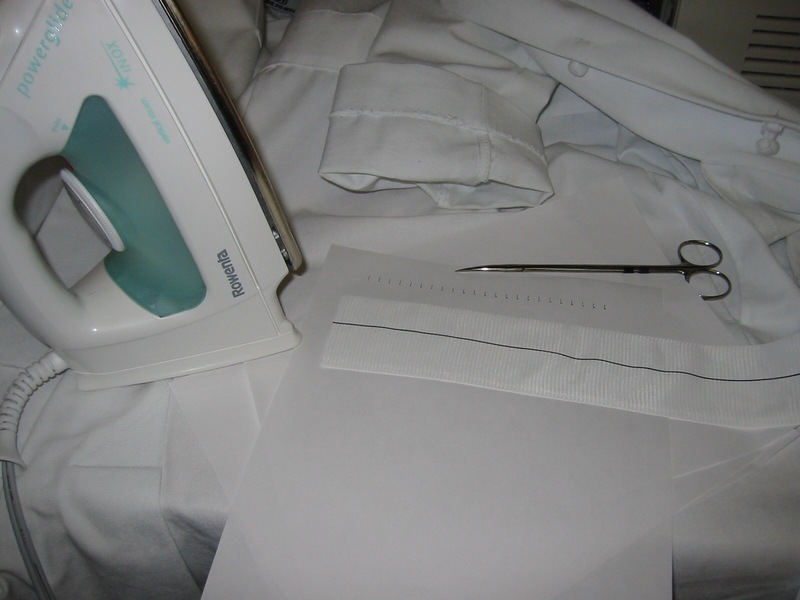 The other option was an open thrombectomy and patch angioplasty -the thighs were prepped in case we had to harvest vein. Again, in the setting of dissection and going into the mesentery, an open revascularization while feasible, is challenging. Thrombectomy catheters like Angiojet were available, but I chose to try the Export aspiration catheter (Medtronic). It is simple to set up and goes over a 0.14 wire. It is designed for the coronaries which have a similar lumenal diameter as the SMA. It worked well in this setting in retrieving thrombus which had a pale element that may have indicated some chronicity. The completion arteriogram was satisfying. 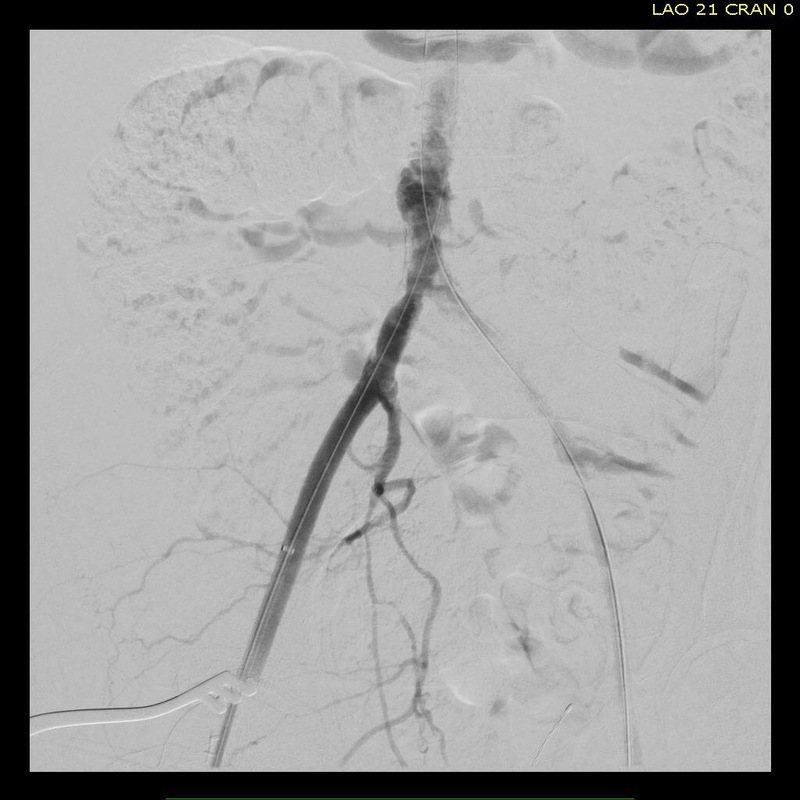 The SMA completely filled as did the celiac axis and both renal arteries. I opted not to treat the right renal artery as we had given 250mL of contrast, and it was filling well without intervention. The patient was making excellent urine and his blood pressure had been maintained with mean arterial pressures above 70mmHg. 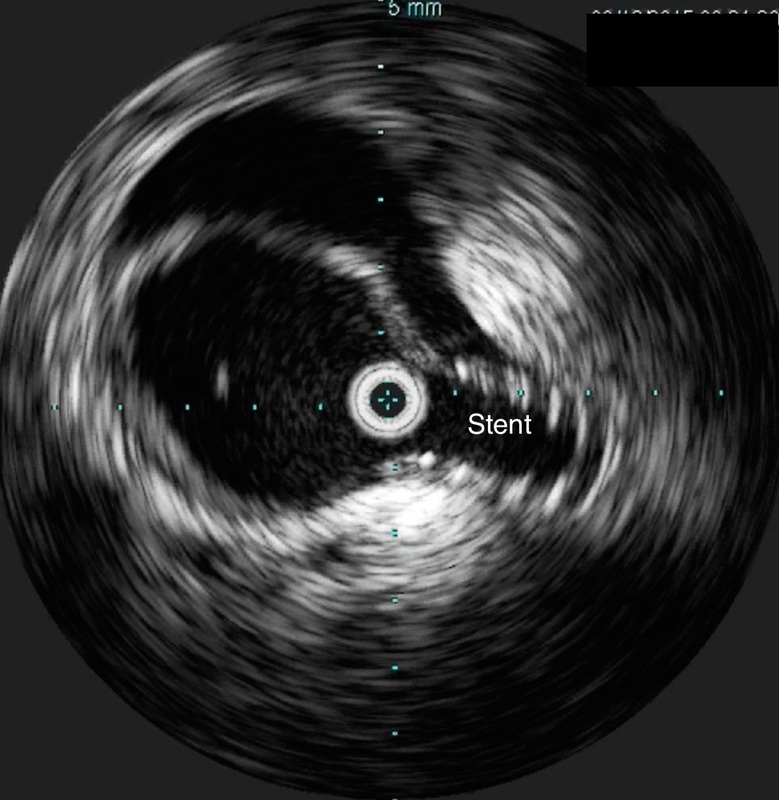 At this point, IVUS confirmed good deployment of the stent. The sheath was removed and the access site repaired. The general surgeons explored the patient and found all the bowel to be well perfused with pulsatile flows seen in the mesenteric arcade. The appendix was removed. On waking, the patient was noted to not move his legs. A spinal drain was expertly placed by our cardiac anesthesia staff and his blood pressure was raised to MAP’s above 80. He recovered motor function in his legs soon after. 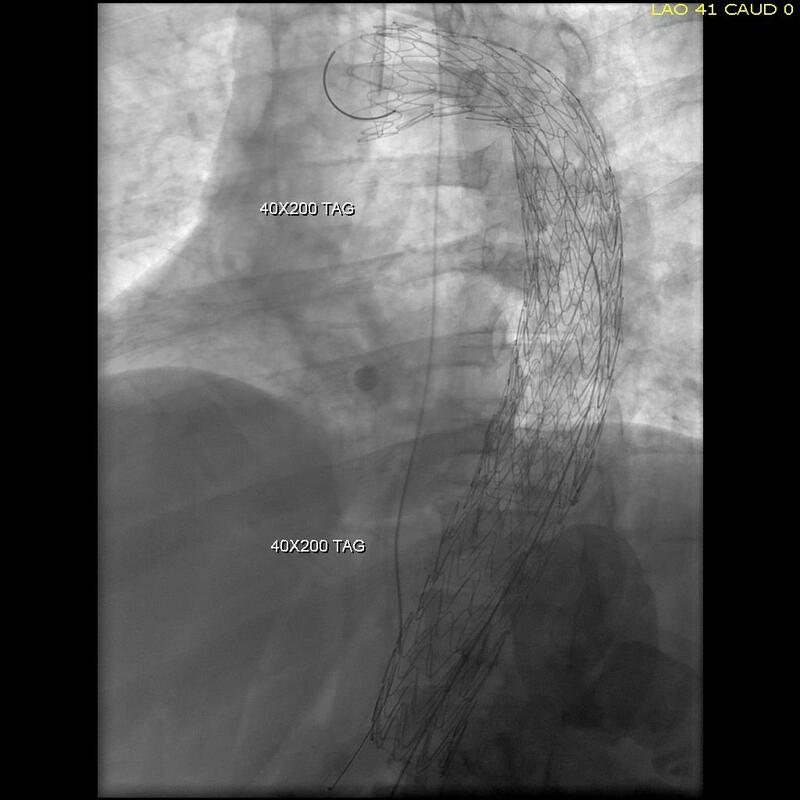 I usually don’t place preop CSF drains in this scenario in the presence of good pelvic circulation, no history of infrarenal aortic interventions, and patency of the left subclavian artery. That said, with TEVAR of TBAD, there is a small incidence of paraplegia (1-5%) which I emphasize in my preoperative discussion. 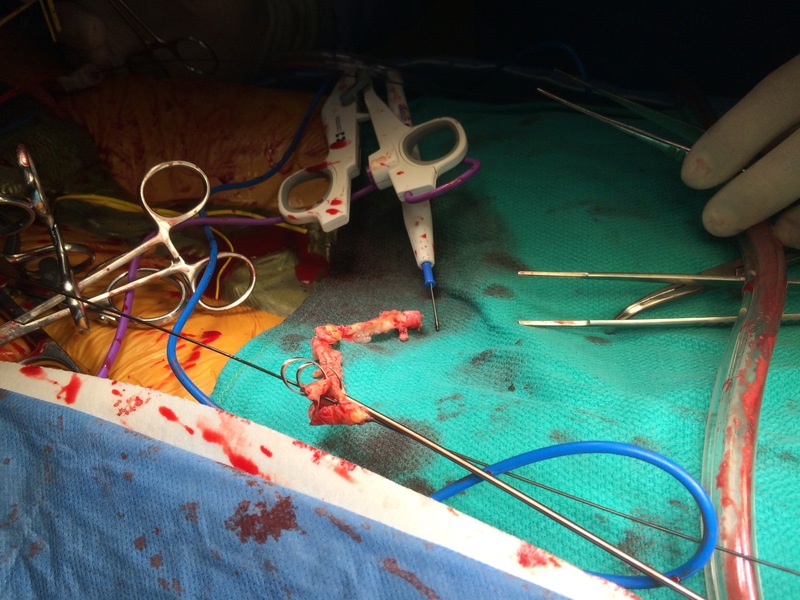 He was started on heparin anticoagulation postop because of his history of SMV and now SMA thrombosis, interrupting it briefly to remove the CSF drain. 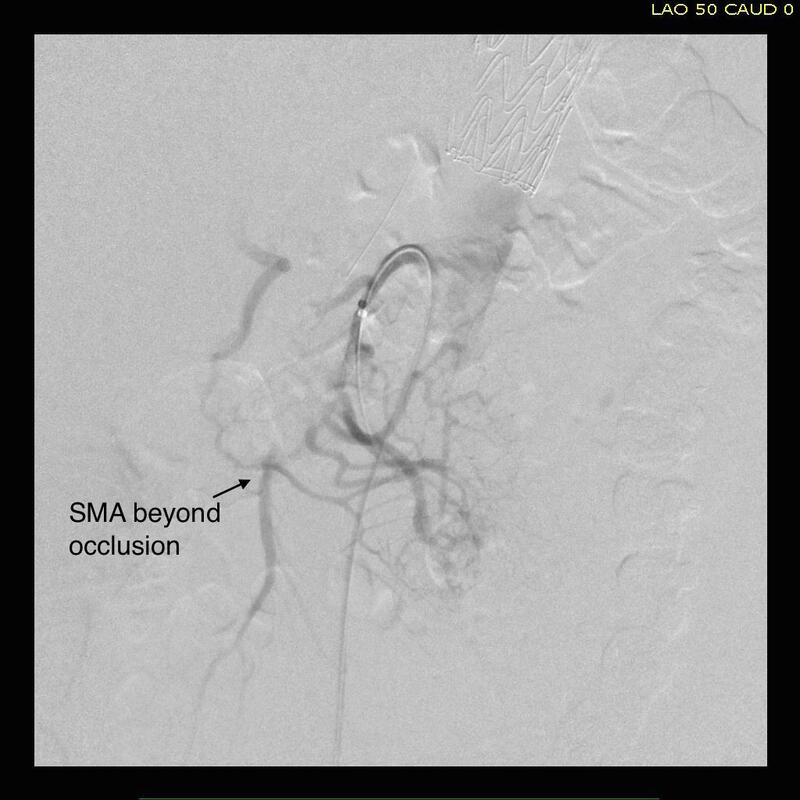 A CTA was obtained to confirm absence of bleeding showing obliteration of the dissection in the aorta and good patency through the true lumen of the SMA. Most importantly, he had complete relief of his abdominal pain. The treatment of acute mesenteric ischemia has greatly evolved since I presented my paper in 2002. While open revascularization remains a gold standard, it is becoming increasingly apparent that good to better results may be obtained with an endovascular approach. Dan Clair, our chair, has made the comment that early revascularization with endovascular technique is analogous to emergent PTCA in occlusions of the coronary system and that re-establishing flow is a critical first step. Open exploration still is the mainstay of managing acute mesenteric ischemia, but laparoscopic exploration remains feasible. 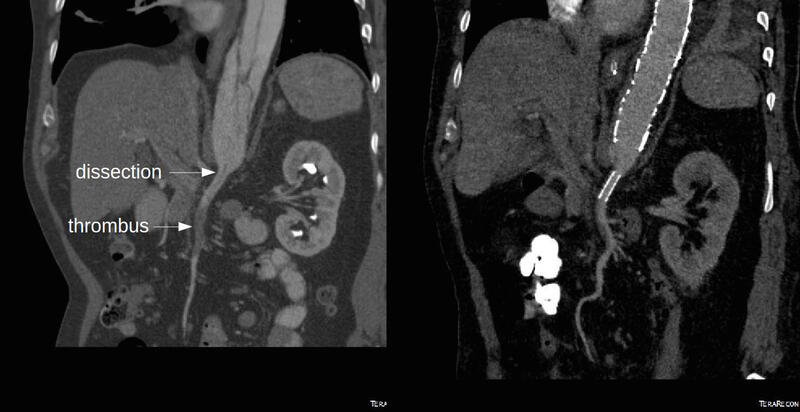 This patient underwent open conversion after an initial laparoscopic exploration to remove a ruptured retrocecal appendix that had been treated for over a month on antibiotics. Without bowel necrosis, a second look is usually unnecessary, but is critical when threatened bowel is left behind. Park WM et al. J Vasc Surg. 2002 Mar;35(3):445-52. The patient had diffuse atherosclerosis with small luminal area even in areas without calcified plaque. 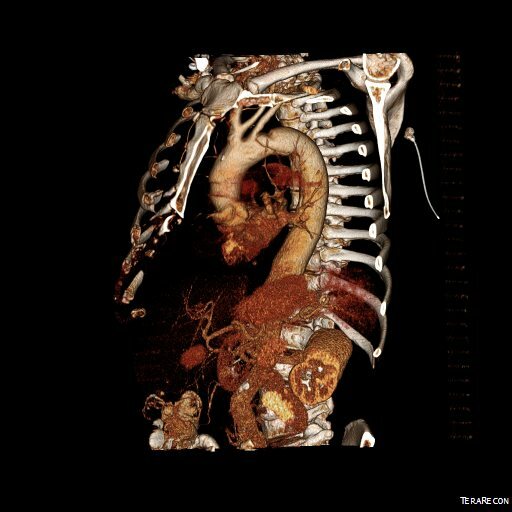 It predicted inaccessibility for the 22 French sheath required to deliver the 32mm C-TAG device to be placed for a symptomatic type B thoracic aortic dissection associated with a small but expanding proximal aneurysm. 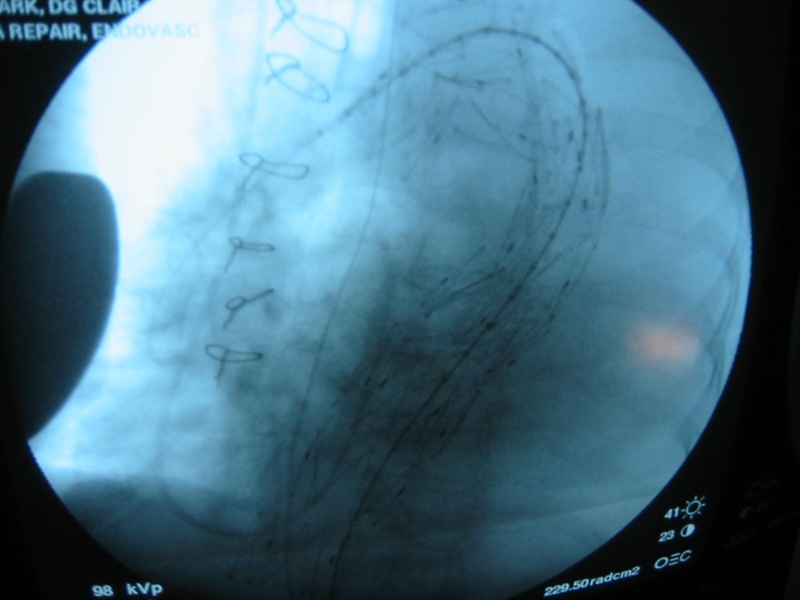 My options included direct aortic puncture, an aortofemoral conduit, or an endoconduit. 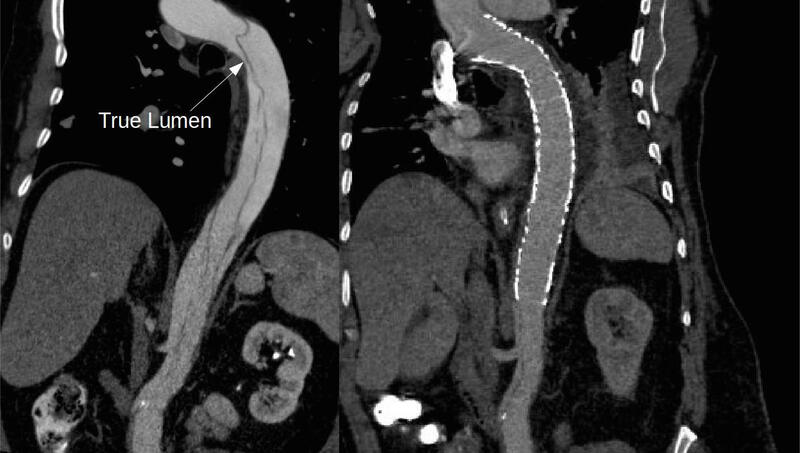 The aorta was heavily calcified and the bifurcation was narrowed by circumferential plaque down to 6-7mm at its narrowest and the left iliac had a severe narrowing due to this plaque. The common femoral artery was severely diseased with a lumen diameter of 4mm due to heavily calcified plaque. 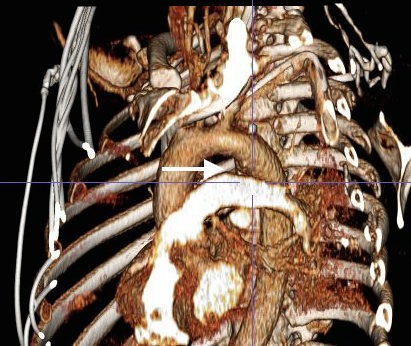 I have come to favor direct aortic puncture over conduits, but the heavily calcified aorta and the absence of safe areas to clamp made me think about other options. My experience with endoconduits has been limited to revising problems of endoconduits from elsewhere, but others report it as a feasible option. 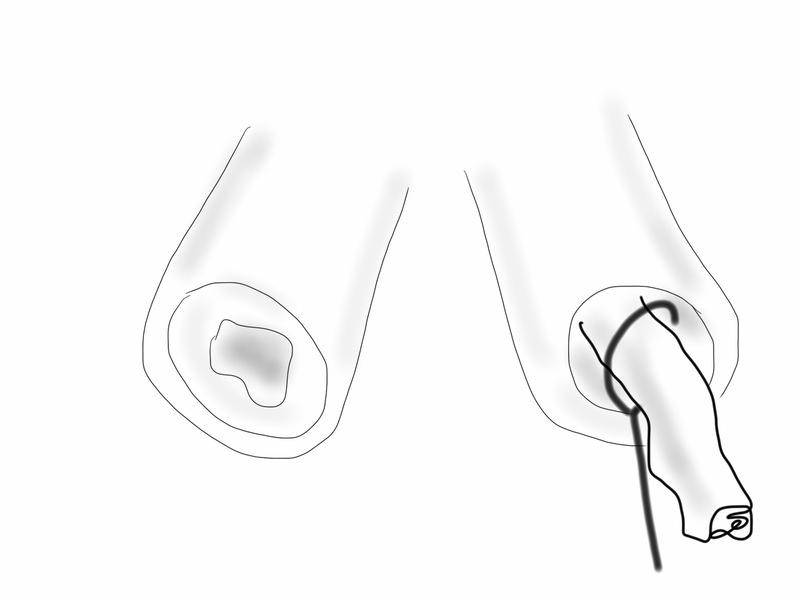 The problem with a long artery narrowed with irregular plaque and even intimal thickening is that it will readily expand to accommodate a large sheath but removing it involves the frictional resistance of the whole artery and typically the “iliac on a stick” avulsion involves the whole length of external iliac artery, likely because the common iliac is anchored by the aortoiliac plaque, the smaller diameter of the EIA, and the longer more tortuous path offering greater resistance in the EIA compared to the aorto-common iliac segment. Remote endarterectomy, a technique involving endarterectomizing an artery through a single arteriotomy, offers the possibility of increasing the lumen of even a mildly diseased artery and reducing the frictional coefficient, assuming the remnant smooth adventitia is less resistant than rough irregular intimal plaque. 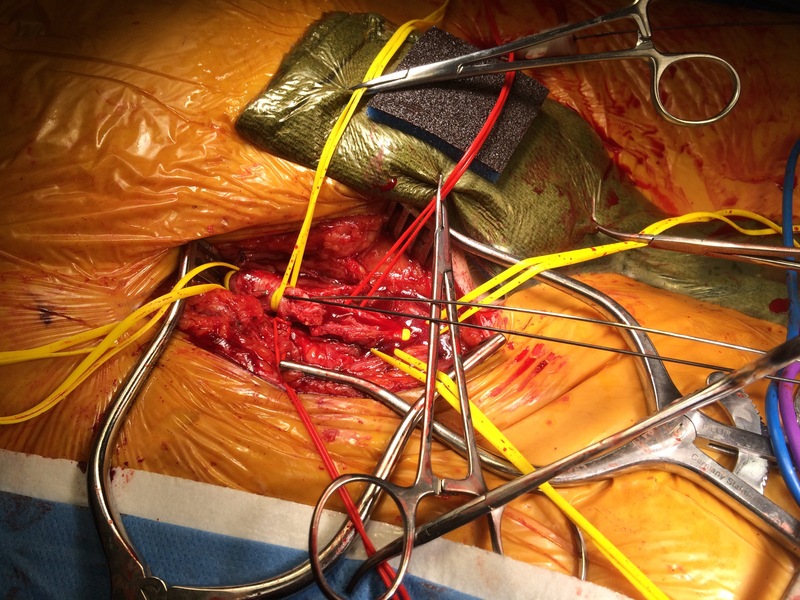 The plan was to expose the right common femoral artery and endarterectomize it and gain wire access from the R. CFA. 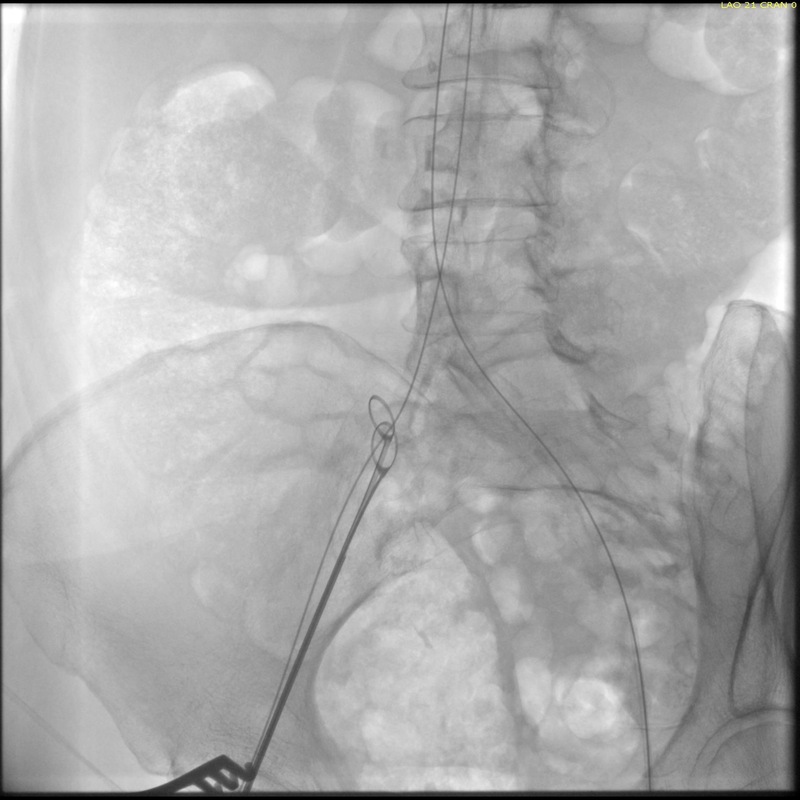 A wire would be placed on the left iliofemoral system to protect it for later kissing iliac stents. A right EIA remote endarterectomy would be performed, and then the right aorto-common iliac segment would be balloon dilated to 8mm. The operation went as planned. 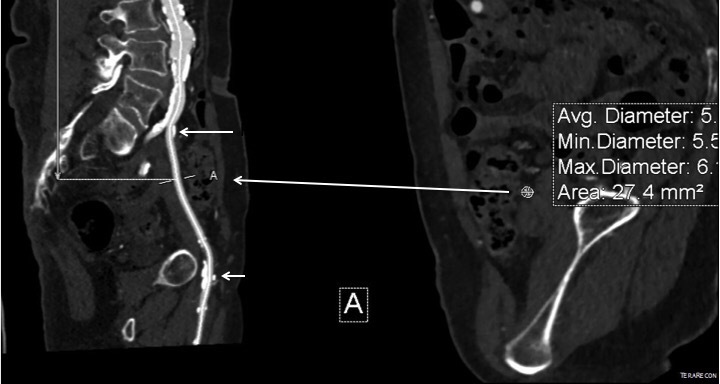 The external iliac plaque was removed in a single piece from the EIA origin. Arteriography showed the right EIA to be free of intimal disease, and dilators and ultimately the 22F sheath went in easily. 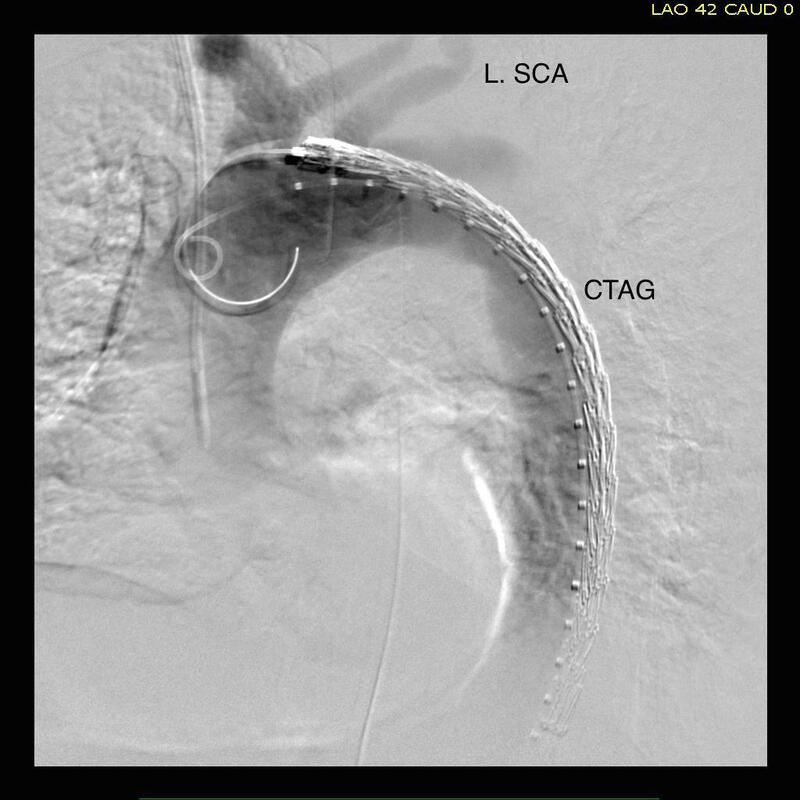 The TEVAR also went uneventully -the left subclavian which had a prior common carotid to subclavian bypass, was covered and the aneurysm and flap were excluded from the left CCA to the celiac axis. 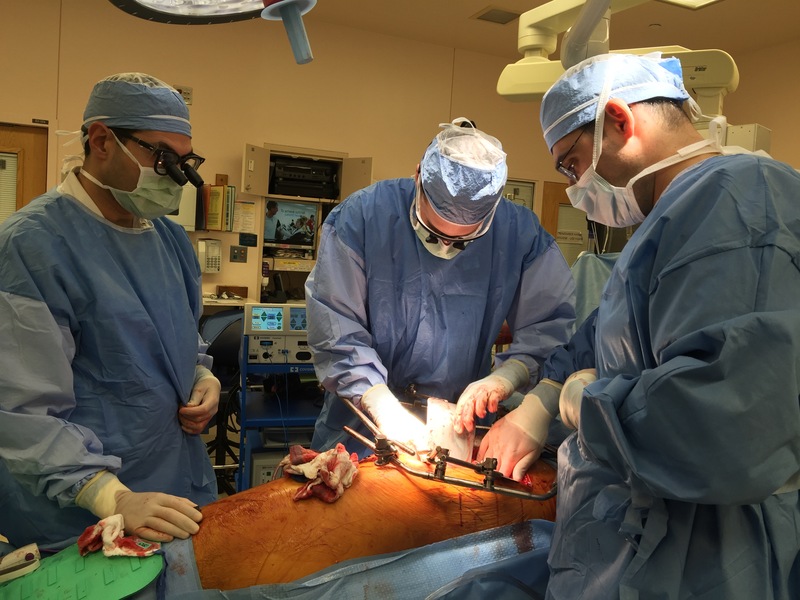 The most difficult part of the operation was removing the sheath, as is usually the case with a tight iliac, but the friction point was largely at the common iliac and not the external iliac. No artery could be seen extruding with the sheath at the groin while steady tension was applied to the sheath under fluoro. The aortic bifurcation was repaired with kissing iliac stent. The patient recovered well and her chest pain resolved. I have done this for EVAR, including reopening occluded external iliac arteries, and even for a 26F access for TAVR, avoiding the need for placement of a conduit in selected patients. Addendum: in followup, I had the chance to check up on the repair -the EIA remained large and patent.